Speedy the cheeky house bunny: Look what my Dad did to me! Look...Look what my Dad has done,he's trussed me up with my scarf,and look he didn't even put it on right! An indignant Speedy! "Mummy!Do something!! "Shouts Speedy"I'm coming Speedy oh my gosh what has Dad done now he hasn't even put it on right"Mum unties the scarf as Speedy struggles with it. It does not look comfortable at all, but it does look nice on you! Sometimes we have to sacrifice comfort for fashion, Speedums. You DO look flippin' adorable in that scarf, although I am thinking BLUE is more your color. A bright royal blue, or even turquiose blue. You are just cute in any color. I bet Dad did that because you pointed out the shed needs some maintenance, and now he has to work on it. mum always puts it on me loose and comfy and it becimes part of play time,but dad just trussed me up! yes mummy is always there to save the day! Speedy is giving the cherry look of disapproval ever apparent in albino buns. My Tiny had it quite often, especially if you sat on her spot. I am amazed your dad even managed to get it on in the first place! I was caught by surprise! Speedy, I hope you are going to rethink this. You look beautimous. In any little boy bunn's life, there is a time when Mum does all the dressing, and then the little bunn reaches the age of reason and has to start dressing like Dad. oh this isn't dressing like dad he doesn't wear scarfs!He was teasing me! Well, Speedy, I'm sorry to hear that your Dad was teasing you. Are, are you really sure? You look so nice. Maybe he just wants you to have your own "look". I'll really be sorry if your suspicions turn out to be well-founded. You know, you may just have to turn him over to Mum, and let her take care of him. That can be hard on a young bunn, but it is was Mums are for. Oh dear, that just won't do. Mr. Mick says dads are never very helpful with matters of fashion, and they shouldn't even try. Mr Mick is so right!I shall have plot his punishment! Speedy! It looks fabulous! Me thinks Daddy's is not quite as good as dressing us as Mommy's though. Well, I hope you change the greeting on the Christmas card. Somehow, "I am not amused", just doesn't convey much Christmas cheer. The red does go very nicely with your beautiful white furs. Heh heh. 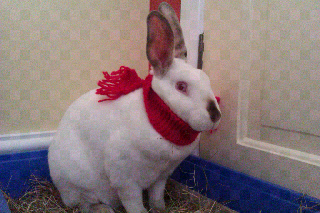 Well, be glad it was at least a very nice red scarf and not the awful cone I had to wear for a few weeks. You are so handsome, Speedy Bunny! The red is perfect for your fur and your beautiful cranberry eyes!